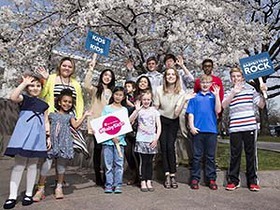 Actress and platinum-selling recording artist Bridgit Mendler has teamed up with Save the Children to launch #BabySitIn, a volunteer campaign for teens to help babies in the United States and around the world get a healthy start. Known for her star role on the Disney Channel’s Good Luck Charlie series, Mendler is also a youth advocate and has become the newest artist ambassador for Save the Children, the organization announced today. Mendler is calling on all babysitters to hold a #BabySitIn between Mother’s Day on May 11 and Father’s Day on June 15. Here is how a #BabySitIn works: a teen volunteers his/her babysitting time to a family; the family gives a donation to Save the Children in the babysitter’s name; and Save the Children uses that donation to help the world’s babies and toddlers. Then, everyone spreads the word through social media. To get involved, visit www.savethechildren.org\BabySitIn. After seeing first-hand Save the Children’s education, health and nutrition programs in the mountainous region of El Quiché, Guatemala, last month, and early learning activities in California’s Central Valley last fall, Bridgit became an avid supporter of the organization and advocate for issues affecting children. In addition to Mendler, key speakers at Save the Children’s Advocacy Summit on April 8 and 9 include Secretary of Education Arne Duncan, Senator John Boozman (R-AR), Senator Tim Kaine (D-VA), Congressman Richard Hanna (R-NY), Andrea Mitchell of MSNBC’s Andrea Mitchell Reports, Cokie Roberts of ABC and NPR, and CNN’s Kevin Madden and Stephanie Cutter.